A $10,000 grant from The Willary Foundation helped NeighborWorks NEPA launch Light The Town this year as an add-on component to Paint The Town. Johnna and Michael Davis of Rundle Street in Scranton were among the grateful recipients of new solar security lights. The Davis family also received a complete exterior paint job. 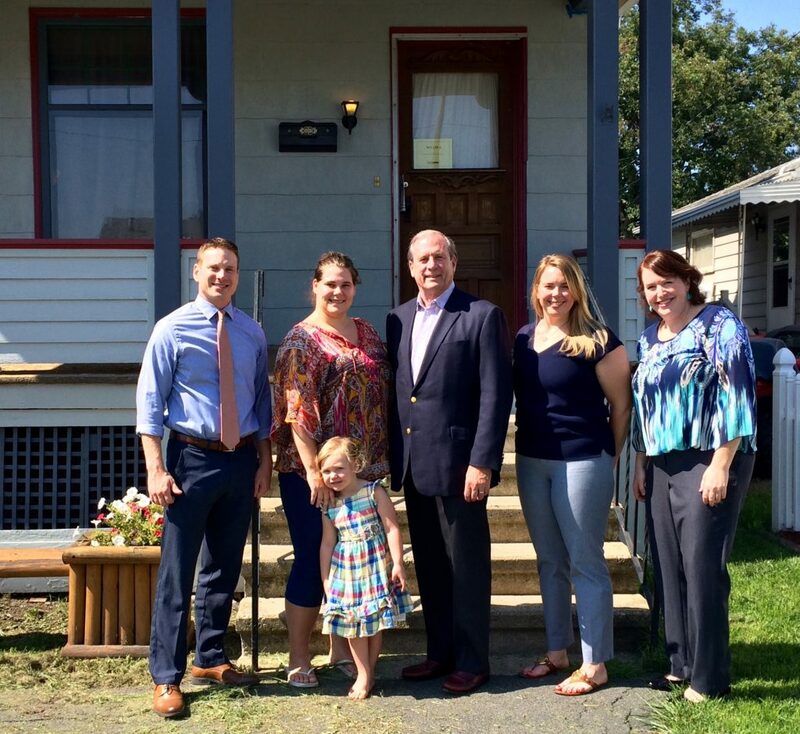 Shown are: NeighborWorks NEPA President & CEO Jesse Ergott; Johnna Davis and daughter; Bill Scranton of The Willary Foundation; Jennifer Spitler, NWNEPA Director of Neighborhood Redevelopment; and Sandra Snyder, NWNEPA development and events coordinator. The Margaret Briggs Foundation awarded a $35,000 grant to Project PAR, or Property Acquisition & Redevelopment, a grant that helped us purchase our two latest rehab properties, which we plan to renovate and resell at an affordable price. We will reinvest the revenue the sale generates directly back into service projects in struggling areas of Scranton. The ESSA Foundation awarded a $7500 grant to assist us with the extensive renovations needed within our PAR properties. Those renovations will be made by a team of volunteers as well as professional contractors. Our key partner on this project is Johnson College. The Willary Foundation awarded a $10,000 grant to help us launch Light The Town, an add-on component to our signature service project, Paint The Town. This year, several Paint The Town clients as well as several new clients received brand-new, installed solar security lights on their properties thanks to the kindness of the Willary Foundation. Finally, The Home Depot Foundation awarded a $3,000 Community Impact Grant to help us arrange a bathroom modification for World War II veteran Gene Passarella, a.k.a. Gene Dempsey of The Gene Dempsey Orchestra, and his beloved wife, Louise. During the war, Gene suffered a debilitating knee injury that affects his leg to this day, and getting in and out of his high-walled bathtub was becoming more and more difficult. We can’t do what we do without the support of these funders, and we join our most grateful clients in thanking them for their confidence and support!